These are small 0.9″ Diameter Round Rocker Switches. Snap it into a 3/4 inch hole and you’re good to go. Clean, easy, and attractive. The maximum current load is about 16 amps at 12 volts, so you can safely power plenty of LED tubes, thousands of individual LEDs, plus an underbody kit. 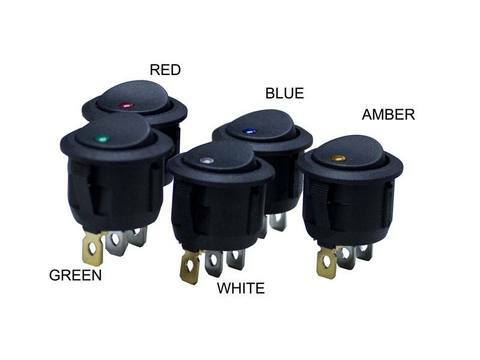 These are a great option if you’re looking to add an accessory switch switch to your Vehicle. This is not a pushbutton switch. It is a rocker switch. There are no wire leads connected to this switch. You can connect wire either via solder, or crimp-on female quick connects (which we recommend!). Please contact us if you have interest in pre-connected wire. (On) / Off = Usually OFF, but when you press the switch, it turns ON. When you let go, it turns back OFF. Are you looking for a 3 position momentary switch (on/off/on), like a power window switch, where it returns to the center neutral position automatically when you let go of the switch? Great! Simply buy the the “On / Off / On” style.